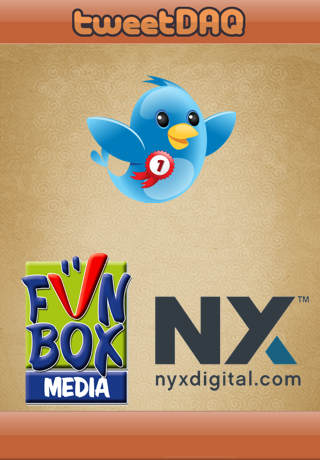 Brought to you by Funbox Media Ltd.
TweetDAQ, available on iPhone, iPod Touch and iPad, charts Twitter activity and progress on Twitter so you, and your peers, can really find out how good you are! Do you know what you’re doing? Most importantly, do you have a loyal following interested in what you’re saying? As a casual user, TweetDAQ will add endless fun to Twitter use, and for the addict turned pro, TweetDAQ provides stats to enable a real understanding of progress achieved. When TweetDAQ is launched it retrieves Twitter statistics from the previous 24 hours and adds this to current totals obtained in the last week. Bronze, silver, gold and platinum badges are awarded for a range of criteria including; New Followers, New Tweets and your Sphere of Influence. TweetDAQ has Game Centre integration to show who’s bossing Twitter! TweetDAQ is the ideal companion to any Twitter account, providing extra entertainment and performance ratings for the casual Tweeter to the Twitter addict alike. Follow @TweetDAQApp and @Funboxmedialtd for the latest news and information. Waited until Midnight to download this so I can be the 1st on the leaderboard and was still beaten to it. 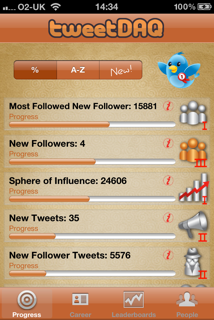 This App is a MUST have for any Tweeter and it will get BETTER and BETTER with the more users it gets. They are also running a competition to win an iPad3 and £50 iTunes voucher. All you have to do is follow @TweetDAQApp , download the App and write a review on the App Store!